Do you love to have a pot roast for dinner every once in a while? I certainly do, especially as the weather turns to cooler temperatures. The cool temperatures of fall make this a great time to break out your slow cooker. As you probably know, pot roast is most often made with a chuck roast. Chuck is flavorful, but a relatively tough cut of beef. The key to a delicious pot roast is to use flavorful ingredients and to cook the roast till the cows come home...so to speak. 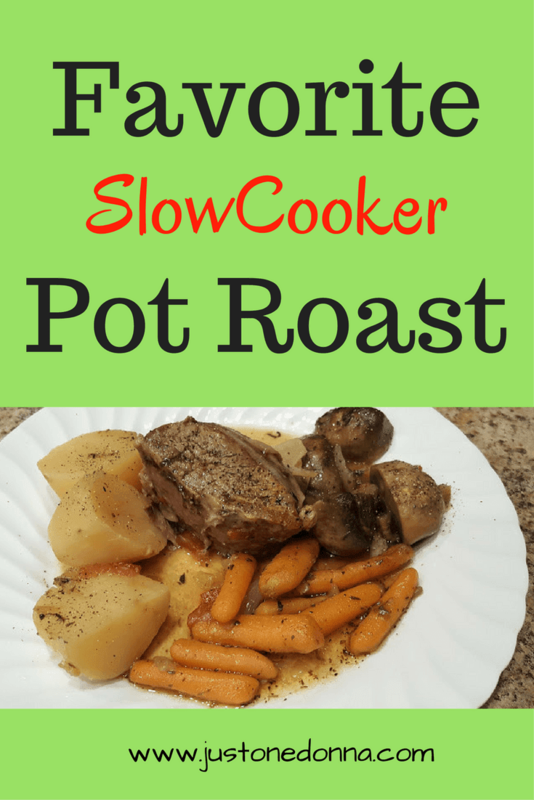 That makes pot roast a perfect recipe for the slow cooker. A long, slow roast is necessary to break down the tough connective tissue. You want to cook your roast until you can pull it apart with a fork. No knife should be required. 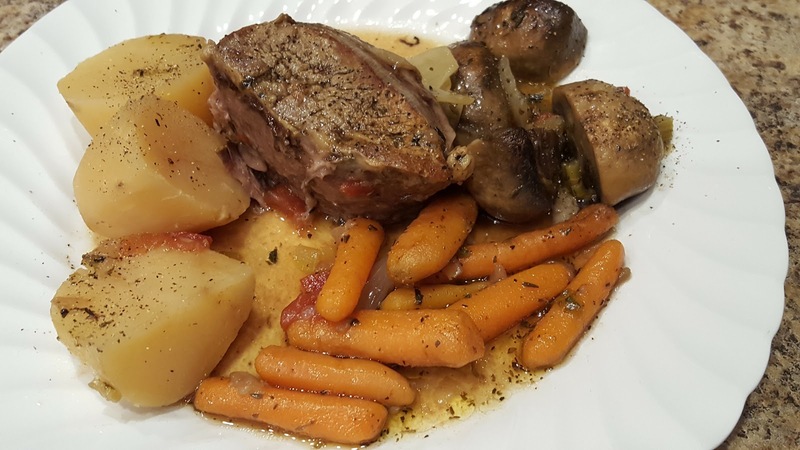 Cooking a delicious pot roast is really easy to do as long as you give yourself enough time for the long, slow roasting of the meat. A plus to a pot roast meal is that you can make it a one-pot dinner. Everything can be cooked in the slow cooker with the roast. That makes for easy preparation and easy cleanup. What's not to love about that? I adore my Ninja Cooking System for making a pot roast. I love that I can brown the meat right in the pan of the Ninja Cooking System before adding the rest of the ingredients. I love that it automatically switches to a buffet setting when the slow cooking cycle is finished. This keeps the dinner warm for up to six hours. I love that the pan removes easily from the system for easy cleaning. I love this kitchen appliance so much that I bought three of them! If your slow cooker has a stovetop function you'll be able to complete the entire cooking process in your slow cooker. If not, you will need to brown your roast on your stove over medium-high heat. Click this link for directions to make your pot roast in your oven. Set the stovetop function on your slow cooker to high. Add the oil. Season the meat generously with salt and ground black pepper. Don't be shy with your seasoning. A delicious pot roast has layers of flavor and this will be your first layer. Remember your roast has two sides. Season both sides, friends. Add the oil to the pan and carefully place the meat in the pot. Sear both sides until they are brown. This will take 8-10 minutes. The meat will release itself from the pan when it is seared enough so don't struggle with it or rush the searing process. Remove the meat to a plate. You may need to pour off some of the fat. You want to have two tablespoons of oil in the pan. Add the onion, carrots, celery, and garlic to the pan. Cook the vegetables until they are tender, about 8 minutes. Sprinkle the flour over the vegetables and using a wooden spoon, scrape up any browned bits from the bottom of the pan. Add the wine and the tomatoes, cooking until the liquid thickens, about 5 minutes. Next add the beef broth, thyme, Italian seasoning, and bay leaves and bring to a boil. Nestle the roast in the liquid. The liquid will surround, but not cover the roast. Cover the slow cooker and set the cook time to 8 hours. Prepare the vegetables you plan to serve with your pot roast. I used potatoes, carrots, mushrooms and onion wedges. Peel and quarter the potatoes and carrots. Depending on the size of the mushrooms you can either leave them whole or cut them in half. After four hours, add your vegetables around the roast, cover the slow cooker and continue cooking for four more hours. Before serving, stir in the vinegar to add brightness to the sauce.